That funky elephant icon with the big trunk could be telling you something about staying digitally organized. 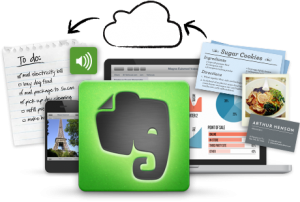 Evernote is a great application that keeps your thoughts and important notes organized across various platforms including desktop PC (Windows desktop aka Win 7 and Windows 8 with touch capabilities) and Mac, smartphone OS including Android and iOS (iPhone or iPad), Windows Phone, Blackberry, WebOS. You might think, ‘’My digital devices come with a note taking app already. Why can’t I use that?” The great win with Evernote is that it is cross compatible with all the popular operating system devices. No longer is a specific brand keeping you away from your notes. If you’re an iPad owner with an Android phone, you don’t have anything to worry about. You can get your notes sharing and syncing across devices in real time. 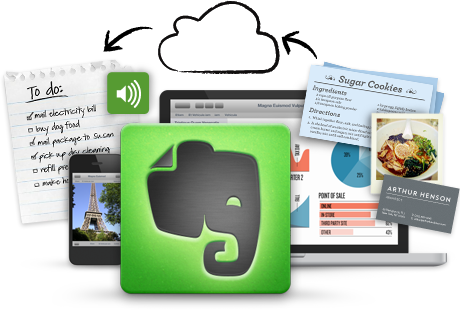 My love affair with Evernote started when I was tired of searching for the perfect app. I have the AppsGoneFree app on my iPhone and I’m also quite familiar with Google apps as well. I was just plain old tired of not having something to record my thoughts to right away. The Notes app for the iOS was too limiting. I found love with evernote because it allowed me to think freely without letting the software get in the way. I enjoy writing, I absolutely love thinking and brainstorming on my next blog post, research project or business plan. With uploading various media and attachments to evernote along with text, I am set. I never have to leave the evernote environment because I have it running on my PC at work, my Mac at home, my iPad and iPhone. When I get back to the android phones, I’ll have it there, too. My ideas are safe and secure with Evernote. Plus, I can have people jump in and share ideas via notebooks when I want them to. My ideas are in the cloud while my head remains focused with evernote! Regardless of what device you have, the UI advocate in me encourages everyone to play around with the mobile or desktop app. how to create stacks ( which are folder like “stacks” of notebooks with messages organized per notebook). how to share notebooks with other email addresses to have them view it. It’s a cloud app that will back up your devices to the cloud and then download it to your other devices with the Evernote app. You literally can stay on the same page. You can create notebooks and share with anyone you’d like to collaborate with. Keep in mind, the free version of Evernote does not allow you to view notes offline. For offline notes, Evernote does offer a premium version that might be worth your buck if you become a serious power user. Evernote is great in that it integrates with mainstream devices yet offers one place to stay organized. The easiest thing we can all do is get lost on many options, apps and ways of doing things. When it comes to being productive for personal or business tasks, you have a cloud syncing app at at your fingers. Ultimately, whatever app you choose, you must be consistent and streamlined with your efforts. When it comes to staying digitally organized, approach your needs with systemized thinking. What digital tools will help you focus with getting work done vs. fiddling with technology to get it done? The most important thing is to you know your needs when collecting insights from various technology applications out there! Be sure to stay tuned with follow up articles on Evernote strategies and insights on how you can use the app for your needs! Sana currently works with Fortune 100 brands and was previously Assistant COO of Mashable. She combines her years of experience in literacy and social media to provide effective technology training in business, learning and personal productivity. WordPress Wednesday: Is Your WordPress Secure?